Today, I present to you the perfect muffin recipe. That’s what Deb of Smitten Kitchen called it, and after trying her recipe last weekend, I can confirm that the recipe is, indeed, perfect. The muffins turned out so light, fluffy and flavorful that no one could tell they were healthy muffins masquerading as crazy-delicious muffins. I used whole wheat pastry flour to ensure that the muffins would end up as light and fluffy as they would using white flour. Greek yogurt and lemon zest lent a decadent texture and flavor, respectively. For the fruit, I used blueberries and blackberries, whereas Deb used blueberries only. Neither of those berries are in season, but you could certainly substitute other seasonal fruit or frozen fruit. You can’t go wrong with this versatile recipe! 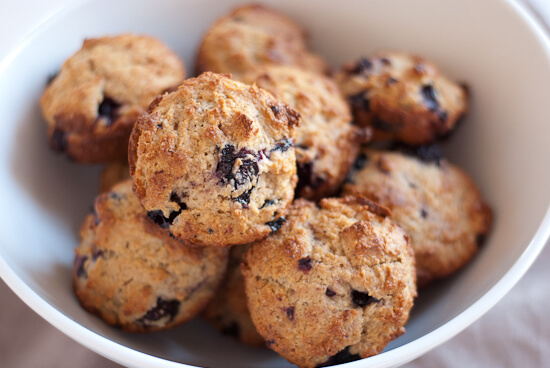 My “perfect” blueberry muffins are made with whole wheat flour and Greek yogurt. So delicious, no one will guess they’re healthy, too! Recipe yields 9 to 10 standard muffins. ¾ cup blueberries, fresh or frozen (if frozen, don’t bother defrosting). I suspect any muffin-friendly fruit would be great! Line a muffin tin with paper liners or spray with nonstick cooking spray. If you have an electric mixer, use it to beat the butter and sugar until light and fluffy (that’s how Deb did it). I mixed the ingredients by hand, with a whisk, since I don’t have an electric mixer. Add egg and beat well, then yogurt and zest. If you have a sifter, sift together flour, baking powder, baking soda and salt and sift half of dry ingredients over batter. I don’t have a sifter, so I mixed the dry ingredients together in a separate bowl and added it to the bowl of liquid ingredients. Sift (or add) remaining dry ingredients into batter and mix just until the flour disappears. Gently fold in your blueberries (or whatever fruit you’re using). Bake for 25 to 30 minutes, until the tops are golden. Enjoy! Recipe adapted from Smitten Kitchen, which was adapted from Cooks Illustrated. 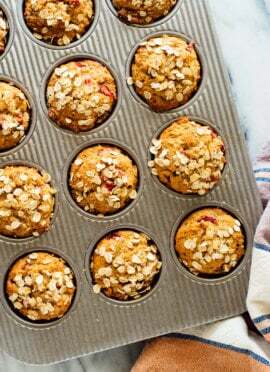 I can’t wait to try making these muffins with chopped apples and cinnamon, cranberries and whatever else I can find. What will you try? mmm those look so good! I would love one right now! I’ve made her blueberry crumb bars but used raspberries instead and they delish. I like your idea of adding blackberries. Blackberries are my favorite, so I couldn’t resist adding some! Your blueberry crumb bars sound amazing. I hope you’ll post the recipe sometime! I haven’t made muffins in forever. Those look so tasty! I think blueberry is my favorite kind of muffin. I will attest to the perfection of these muffins! so good. So after you commented on my soda bread I popped over to your site and have been on here for at least a half hour marking down ideas! I think we may be culinary soulmates. It’s a toss up of what I want to make first- your coconut pancakes or the sweet potato chili! these look so yummy kate and as always, your photos are lovely! You might consider submitting something to the editorial section of Bon Appetit magazine. Your blog deserves some national attention. Your pictures are always so great. Most classic. Your comment made my day, Tracy! Thank you! have you tried making a cornmeal version of this recipe? I’d be interested if you do. Ok, these just got out of the oven and are awesome!!! I made them with blackberries and are still warm in my mouth. Found ya on tastespotting :) Can’t wait to see what else you come up with. this look amazing.. i love having blueberry muffin for breakfast to go with my coffee..i know this would be perfect. thanks for sharing this. I was a little worried because the batter was so thick. But they really are perfect! Thank you! I’m so glad you enjoyed the muffins, Maria! Thanks for letting me know. I hope to try making them with orange zest and cranberries before the end of winter! Oh I forgot to say that I made mine with blackberries and raspberries. I used coconut palm sugar instead of turbanado. Just found your site, can’t wait to start exploring. Has anyone tried these with truvia instead of sugar? Hi Megan, I’m sorry I didn’t respond to your question sooner. I got caught up in holiday festivities. I am not familiar with truvia and do not know if anyone has tried substituting it for sugar in this recipe, but if you give it a try please let us know how the muffins turn out! I did try it, and although fluffy wouldn’t be my first adjective they’ve replaced my previous go-to recipie. Thanks for sharing! Just made these today and totally worth it! I had some extra blueberries and greek yogurt to use up and this recipe worked great. I had never used whole wheat pastry flour before but I’m so glad I did! It was cheaper than I expected and the muffins had the greatest consistency. Hi Sophie, I’m sorry I didn’t get back to you sooner. I asked around and responses include apple sauce, mashed banana or soy or coconut yogurt. I would take the taste of these things into consideration—soy yogurt seems to be the only one with a neutral taste. I wonder if coconut milk would work? Procrast-a-baking, I love it! I’m going to try to work that term into a future post. By the way, someone specifically recommended Whole Soy brand of soy yogurt. Please let me know if you try it! That’s awesome, I’m so glad you like the muffins, Emer! These sound great. Has anyone tried using flax in it? I’m sorry, I’m not sure that anyone has! Please let me know how the muffins turn out if you try it. Has anyone tried without sugar??? Im going to try these…they look yummy! I’m not sure if they have, Steph. If you’re trying to avoid granulated sugar, I do have recipes for honey-sweetened banana bread, pumpkin bread and banana coconut muffins on the site. I made these today, and I admit to being *very* skeptical. The batter was so thick it was almost impossible to “fold” in the blueberries. But they are very tasty, nice and moist, and rose nicely! I used white whole wheat flour — it’s all I had in the pantry — and it worked fine. This recipe is a keeper, thanks! Thanks for commenting, Kim! I’ve heard similar fears from others about the batter, but the muffins do turn out nicely. So glad you enjoyed them. 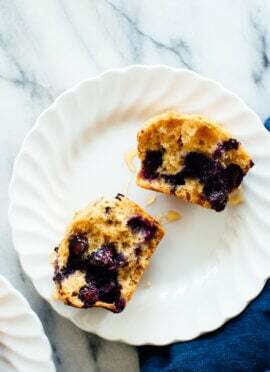 This is my go to blueberry muffin recipe! I love this recipe and have made dozens of muffins since I’ve found it! Thanks, Mckayla, I’m glad to hear it! These look so good! Now I’m craving muffins for real! I will never buy boxed muffins again! These are delicious! Thanks, Morgan! I’m glad you enjoyed the muffins. Thank you for the recipe these will be my breakfast this week ! I’m glad you enjoyed the muffins, Jasmine! Sounds like yours are super lemony. Delicious! Hi there and thank you so much for this fantastic recipe! I’ve made 3 batches in the past two days – everyone I know can’t get enough! :) I doubled the blueberries (we are blueberry loving fools around here, and we just got back from picking organic bloobs fresh from the farm) and added a little lemon juice to pump up the lemon flavor (we are lemon loving fools too!). As a funny aside, I don’t have a muffin tin at the moment and the only muffin cups I had were the unbleached paper ones from whole foods, so I used those and used a regular baking sheet and they turned into “muffin tops” instead of actual muffins, but they taste divine and we loved the “accidental muffin tops.” I also used sucanat instead of turbinado, but it’s pretty much tomato/to-mah-to with that stuff. Thanks again and I’ll definitely be trying more of your recipes soon! PS – Can’t wait until strawberry season rolls around next year – I’m going to use this same recipe with strawberries instead. Definitely my new go-to muffin recipe! A couple of last thoughts (can you tell how excited I am about these, ha!). I used this recipe and it made 12 muffins instead of ten. Maybe it was all of those extra bloobs. Also, I used full-fat Fage brand Greek yogurt, as it has the lowest sugar and highest protein content of any Greek yogurt that I’ve found, and you can’t beat the flavor. Even with that, my Lose It app shows that per muffin, there are 148 calories, 5.6 grams of fat, 2.8 saturated fat, 10.4 g. sugar, 1.8 g. fiber, and 3.2 g. protein. Pretty healthy muffin, and I hope someone else can appreciate the nutrition breakdown. Thanks again! These are positively delicious and oh so moist! The whole wheat was well balanced and did not weigh down the muffins. An ice cream scooper works wonderfully for dividing the batter among the cups. Changes: I didn’t have enough Greek yogurt so I substituted in some ricotta cheese with a splash o’ milk. I replaced 1/4 cup of flour with 1 tablespoon each of wheat bran, ground flax, and oat bran. Also no lemons today :( so I threw in some cinnamon. Next time I might try vanilla extract. I’ll probably make these again but with blackberries, raspberries, or dark chocolate chips. I’m glad you enjoyed the muffins, Leaf! Thanks for sharing your substitution notes with us all. Another great recipe from you :) I had to make some substitutions as I was bringing them to work where I have colleagues who can’t have gluten or dairy products. I used gluten free flour (Bob’s Red Mill, Gluten Free All Purpose Baking Flour), coconut oil for the butter (melted it and mixed with wet ingredients), one banana +apple and lemon juice for the yoghurt. I was a bit short on blueberries so threw in some blackberries. Still, with all these substitutions they turned out GREAT! :) Love the blac/blueberry and lemon combination. Thanks, Marie! I’m glad the muffins turned out well with gluten-free flour. Now I want to try making coconut oil-banana-berry muffins! Looks like a lovely recipe, I love your site! (although I often have to convert measurements or look up ingredients because we use different words for a lot of things here in the UK!) Would fat free natural yogurt work do you think? Hey Kate, I’m so glad you enjoy the site! Yes, I think fat-free natural yogurt would work. I would suggest using two eggs instead of one to make up for lost richness (I used full-fat yogurt and recently tried the recipe with two eggs and preferred the resulting muffins to the one-egg version). I made these yesterday afternoon and they were delicious! I used fat free greek yogurt, added 1 cup of white whole wheat flour + 1/2 cup almond meal (instead 1.5 cups flour), added 1 tbsp of poppy seeds, and used frozen blueberries. The batter was really really thick but the muffins turned out awesome! Emily, your muffins sound fantastic! Thank you for sharing your adaptations. I made these muffins last week and doubled the recipe so I could send some home with my brother inlaw. They were amazing! I did cut back a bit on the butter (I only had one stick) and added in a little bit of mashed banana just to make up for the possible lost moisture from reducing the butter. Everyone really enjoyed them including my brother inlaw’s wife, who happens to be 7 months pregnant! Can’t wait to make them again for our get together with family this Memorial Day weekend! Melissa, thank you for commenting! I’m so glad everyone enjoy the muffins. Your banana-y version sounds great to me! Just made these. Came out great. Was skeptical cause they were so thick. But they are so moist. I did switch out the softened butter for softened coconut oil, the sugar for coconut sugar and added 2 tsp of flax for nutrition. Made them into mini muffins so it would be a go to breakfast for my kids. Took 8-10 minutes to cook. Love them. Will try next. Time with some lemon juice too to vamp up the lemon flavor. Thanks!! Thanks, Janett! Coconut sugar seems to be all the rage now. I need to try it. If you want to maximize the lemon flavor, try rubbing the zest into the sugar with your fingers. It makes a huge difference. I was pleasantly surprised at how well this kept on the countertop. I was even more surprised that I demonstrated the restraint needed to not eat them all at one sitting. This is the recipe that brought WW flours to my house and I’m never looking back. Success! Thank you for commenting, Anne. I’m so glad you enjoyed these whole wheat muffins. You might enjoy some of my other muffin and quick bread recipes! Hi Kate! 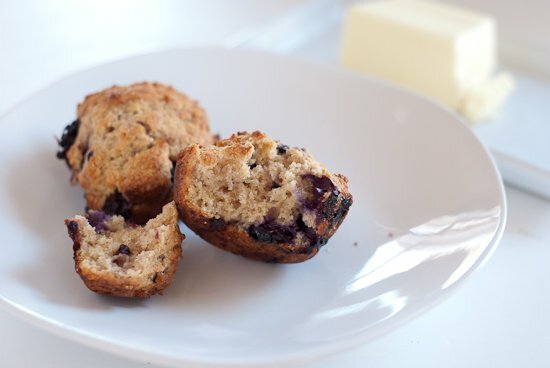 I am dying to make these muffins today but only have regular non-fat yogurt :( How do you think these muffins would fare with regular yogurt as a substitute? Or do you think light sour cream might be an okay sub as well? Thanks! Hi Bethany! Don’t worry, either if those should work! I’m dying to try these tonight but only have regular whole wheat flour, not pastry flour. Do you think it would make much difference? I’m in desperate search of a healthy muffin that my kiddo will actually eat! Hi Angie! I think the muffins would turn out well with regular whole wheat flour, though they will probably have have a slightly nutty wheat flavor. The pastry flour is more neutral. Thanks, Jess! Hope you enjoy the others! I just finished making this blueberry lemon muffins for my boys and they are so goood!! Glad you all enjoyed the muffins! These really are the best muffins ever. Your original recipe is wonderful. I melt the butter and cool slightly. Works great using just a whisk. also use lemon yogurt rather than plain. Finish off adding 1cup coconut. Then sprinkle coconut on each unbaked muffin. The toasted crunch is so tasty. Everyone has loved them. Thank you. Thank you, Katie! Happy to hear it. Any thoughts on how these would be as a loaf instead of muffins? And cooking time? I bet this would make a great loaf! I’m guessing it’ll be done around 45 to 50 minutes, but do keep an eye on it. Please let me know if you try! Thank you! Great recipe! Very moist and delicious – don’t taste reduced calorie or fat. I changed a few things, but nothing too serious. Didn’t have any fresh lemons so instead of the zest, I added a little more than a teaspoon of lemon juice. Chopped up about 2 tablespoons of fresh basil and added with the blueberries (used frozen so tossed them in flour first). Used half and half regular all-purpose flour and whole wheat flour (didn’t have ww pastry flour). Topped with a light mixture of ww flour, organic light brown sugar, and some cinnamon. Only ended up baking for about 23 minutes and came out perfect. Thanks! Two last things – ended up making 12 and that amount of basil was loose and not packed at all. Thanks, Thomas! I wouldn’t have thought to add basil, but that sounds like a delicious addition. Tried these and they were great! Only change I had to make was that my greek yogurt was vanilla (my plain had expired!) Child and Dog approved! Instead of pastry flour, will it work with regular whole wheat flour? Hi Kelsey, I haven’t tried, but I think honey might work! Please let me know if you try. My favorite muffin recipe of all time!! So delicious and easy to make, I made it a dozen times!! I will be trying your Apple muffin next that sounds really healthy and easy too. I have made these numerous items and love them! Is there a way to make them diary free? Butter and yogurt substitute? I’m breastfeeding and think my little one is sensitive to dairy. Hi Amber, that’s a good question. I think you could replace the butter with melted coconut oil. I want to say that homemade “buttermilk” would work in place of the yogurt, but I haven’t tried it. Just add 2 1/2 teaspoons vinegar to a liquid measuring cup and then add your non-dairy milk of choice until it reaches the 3/4 cup mark. I’m not sure you’ll need quite all of it to reach the right consistency. Please let me know if you try! I’m dying to try these muffins, but I only have salted butter. Could I use that & eliminate the salt? Hi Kate! My husband has been asking for blueberry muffins, so I’m going to give these a shot. Do you think coconut sugar would work in these? It’s just what I have. did you use lemon juice in the recipe as I only see lemon zest? I’ve been making these muffins for years since you first posted them and they are my absolute favorite! I came back to this page because I wanted to make some today and it dawned on me to ask if I could replace the butter in this recipe with coconut oil. Would it be possible? And would it be equal parts substitution? Thanks Kate! I am 7 years old and I made your blueberry lemon muffins all by my self. They are delicious. I can really taste the lemon zest. Hi, can i replace butter with canola oil? Maybe 1/4 cup? I made these with equal tbsp. canola oil for butter (spouse is severely lactose intol.) and it worked great. Favorite muffin recipe for now. I plan on making these for Labor Day for my family friends. But I was wondering how much does the recipe serve? It makes 9 to 10 muffins. I’m trying to find a blueberry muffin recipe with NO sugar or maple syrup, or agave. Just maybe sweetened with bananas or apple sauce, etc. Suggestions to alter this recipe to no sugar? Hi Grace, that’s a tough order! I’d probably start with my banana muffins recipe, omit the sweetener and maybe add more bananas (or applesauce) instead, and add blueberries. Please let me know how that works out! So glad they worked out with what you had on hand! & I can’t wait til the books come in :) Hoping you’ll love it! These were FANTASTIC! Didn’t have lemons so I used vanilla extract and the muffins turned out great. 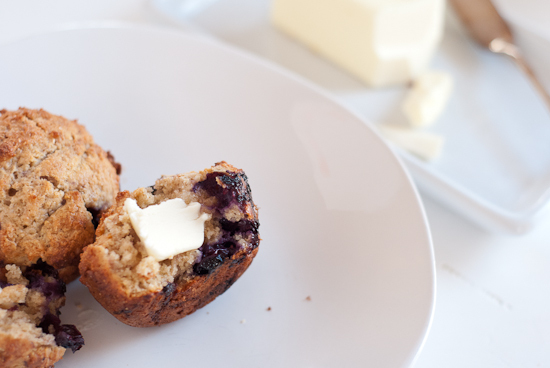 Love the greek yogurt in these muffins. I’m glad that substitution worked out, Christy! Sounds warm and delicious. These are perfection! I’ve been on a muffin kick lately and these are hands down the best; just a little sweetness and perfectly moist. My boyfriend was hesitant about blueberries and lemon in the miffins…then “accidentally” ate half the batch. I am making a double batch tonight. Thanks, Kate! I am in love with your blog and recipes. I love all your recipes!! I made your whole wheat banana muffins..I make them very often to use up the ripe bananas and put them in the freezer so that it’s always at hand when I crave for something sweet. I just made your blueberry muffins with regular whole wheat flour and virgin coconut oil, and they’re a hit too!! So finally I had to leave a comment, it would not be right if I didn’t appreciate your work. Will be making your apple muffins next!! Thank u soo much for all the HEALTHY recipes. Thank you so much, Naila! I’m so glad you’ve enjoyed my recipes. Thanks for commenting. I’m officialy hooked on your recipies :D In the past three days I made these muffins, Red Thai Curry and the Avocado Pesto Toast – yummy! Can’t wait to buy your book! Do you know if it will be available in Germany? This is a great, versatile recipe! I made it with white sugar, whole wheat flour (not pastry), added 1/2 tap vanilla and added a splash of almond milk since I didn’t have quite enough yogurt. They were great! Seems like most reviewers made substitutions based on what they had handy and it turns out great. Very forgiving, yummy muffins!!! Baked mine for 24 minutes exactly. Yum! I’m so glad these worked out so well for you, Caitlin. For these, I used the zest of 1/2 a lemon and its juice – perfect flavor. I used kerrygold butter, organic greek Kirkland fat-free yogurt, unbleached all purpose flour from Trader Joe’s, and about 1 cup of fresh bluberries. 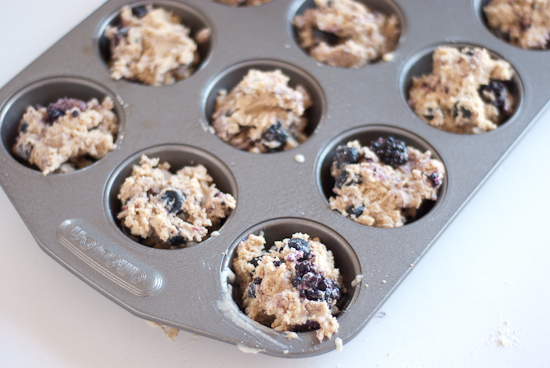 Turned out perfect – great summer muffin :) I highly recommend using silicone muffin baking cups – so easy to pop out. I love all your baking recipes and so does my fiance! He doesn’t typically like “healthy” baked goods, but yours are a winner in our house. I love these and your banana bread – I make them on the regular for us :) Thank you so much! 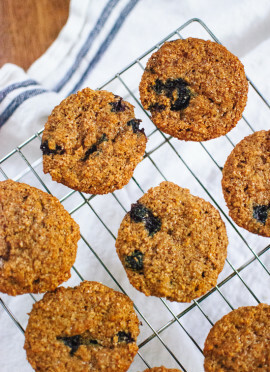 Cookie & Kate – Your recipe for the Lemon Blueberry Muffins is absolutely delicious! I just made two batches of this recipe as mini muffins and am enjoying them! I also made this recipe as mini muffins and gave them away as Christmas gifts last year and they were a big hit! 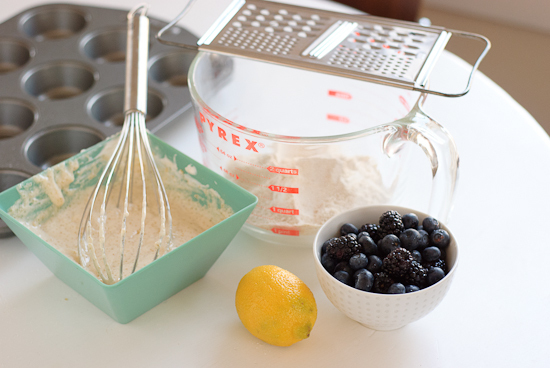 Your recipe for Lemon Blueberry Muffins has now made it into my recipe file. Thank you! PS – Going to make the cranberry cornbread next, but will substitute blueberries for the cranberries. Thank you, Kristine! I hope the cornbread goes well, too. not a big fan of Greek yogurt gobbled up his muffin and didn’t suspect a thing ;) What a delicious way to sneak in healthy baking substitutes. Thanks for making the baking bug bite me with your easy peasy recipes! Hi! Can i substitute butter with coconut oil? Of course! It should be a 1:1 substitution. Excellent recipe, thank you! Turns out nice and light, even when I used a 2:1 ratio of wholemeal to white flour!. Have made twice now, and added a bit extra lemon zest and blueberries the 2nd time and turned out great and flavoursome. Delicious! Thank you, Tayla for your star review. Apart from the other main ingredients, I used 2 eggs (as you have mentioned to do in other comments), low fat greek yoghurt, 55g butter (reduced from the original), a scant 1/2 cup of sugar, 1/2 cup fresh pulp-free orange juice, about 1 Tbsp orange zest, and at the end folded in blueberries and a little bit of chopped white chocolate. They turned out very nicely and flavoursome, though could do with even more zest and some more white choc if wanted. Thanks so much for the base recipe, I have been using it to try all sorts of flavour variations and it is the best!!! Delicious and healthy .What more can you ask for!!!!! Thank you, Maggie! I appreciate the star review. My daughter and I just made these and they are a hit! Even a picky brother/son loved them! We did have to make a few modifications: I am lactose intolerant so we used plain, lactose-free yoghurt but ended up not having enough so we used some applesauce to make up the difference. We did not have turbinado sugar so just used brown sugar. We did not have whole wheat pastry flour so we used 1 cup regular whole wheat flour and 1/2 cup of regular flour and added an extra egg to counter the coarser flour used. Sprinkled a bit of brown sugar on top – yummy. Thank you for the recipe. One day I will have all the correct ingredients and can make it as written but the variation we made was excellent! You’re welcome, Rita! I’m so happy you liked it with your alterations. I appreciate the review. Great recipe. I substitute 1/4 c. flax meal for the flour and use locally grown and milled flour from Beck’s bakery. Delish! Thanks for sharing your substitutions, Lisa. Has anyone tried this recipe with standard whole wheat flour? Does it work well? So excited to try these muffins! Kate has excellent recipes! Let me know what you think, Maggie! I just did! Sorta haha… used half a cup whole wheat flour and a cup of almond meal… delicious! From now on, I will push aside doubts and follow your recipes without questions. I thought “Wow, this is far too thick a batter, obviously missed a liquid.” Nope! I honestly fought to get the batter into each paper liner equally and evenly but holy cow was it worth the effort. These are awwwwwesommmme.